I have suffered bouts of anxiety and depression over the years, and as much as I know that they are real and rooted in chemical, biological and situational origins, I don’t think I do myself any favors by some of my choices, namely, not minding my own business. To illustrate, I know a gal who is (ahem) charming and fancies herself a devoted, if wildly imperfect and at times impertinent servant of the Lord. She tries so hard to be godly that oftentimes she ends up spinning her wheels because she worries: about whether she’s done the right thing, followed through enough, been good enough, smart enough, diligent enough, basically enough-enough. Rules tend to rule her more often than she would like to admit–because she’s no Pharisee (is she?!). For those who don’t know, Pharisees lived in Jesus’ time and were experts in religious law; they knew and followed Scripture to the letter – so much so that they missed the big picture and the spirit of the law. Jesus strongly rebuked them for this, since He came so that we could focus on a saving relationship with Him rather than our own pitiful attempts to follow the Law, which resulted in a sinful, broken world. We fell so short. We fall so short. His grace was/is bigger than any law, and He loved us so much that He came to rescue us from our slavery to our own sin and mess ups at attempting to follow the Law. So, in other words, Jesus is about the exact opposite of a Pharisee. But, on the outside, it looked like the Pharisees had it all together. They did what they were told to the letter, and held others responsible for doing the same, ad nauseum. No grace. No mercy. [pullquote width=”300″ float=”left”]We fell so short. We fall so short. His grace was/is bigger than any law, and He loved us so much that He came to rescue us from our slavery to our own sin and mess ups at attempting to follow the Law. [/pullquote]So the reason this gal doesn’t want to be a Pharisee is that she knows she’s all about the grace, ‘bout the grace, ‘bout the grace – no treble (Thank you Meghan Trainor for that earworm – Google it.) 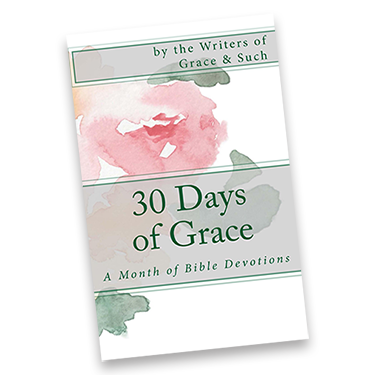 In fact, she is so grateful that she has been saved by grace, and not by works that the idea of Jesus’ love and acceptance and rescue of her brings her to the verge of tears whenever she thinks about it. OK, hold back your shock. That gal is me. As a follower of Jesus, I know that the Holy Spirit leads me and empowers me. I also know that God gave me the free will to actually really follow Him, or to follow myself ‘in Jesus’ name’. Too often, my controlling nature prevails, and I choose the latter. When someone in my life doesn’t believe in Jesus, it’s up to me to save him/her. When someone has a bad day, it’s up to me to make it better. When someone I love makes a bad decision, it’s all my fault. When I am given a task, I have to do the best, so Jesus will know I did a good job, even if I’ve lost sight of Him when I’m working on said task. Basically, if I can’t fix, improve, or be the best at something, then I get worked up. And I worry. Oh, and then I pray. And God, in His infinite grace and patience (re)sets my feet upon His firm foundation and tells me to mind my own business. When someone in my life doesn’t believe in Jesus, even though it grieves me, I need to know that my part includes: a) praying for him/her; b) loving him/her, regardless of where s/he stands in faith; c) giving a godly example of a life led by Christ. Incidentally, their part is accepting God’s salvation or not, and God’s part is offering salvation (just in case you were wondering). When someone in my life has a bad day, my part is to listen and pray for them – not to ‘fix’ them. When someone I love makes a bad decision, my part is to realize that it was his/her decision to make, and I can either choose to judge and condemn, or love on him/her with the grace and mercy that I’ve been given umpteen million times by Jesus. When I am given a task, it’s my part to seek Jesus in how to go about my task and then represent Him as I complete it. So stinkin’ simple, really. But not easy. I get myself ‘wrapped around the axle’ too many times in not minding my own business and trying too hard. And though I can honestly say my intentions are noble, they are faulty, and not only sinful, but they invite the evils of the enemy to step in and invade my mind and behavior. I become perfectionistic. I judge. I am quick to speak, quick to anger, and slow to listen. And I don’t like that. Because I follow Jesus, and Jesus isn’t like that. 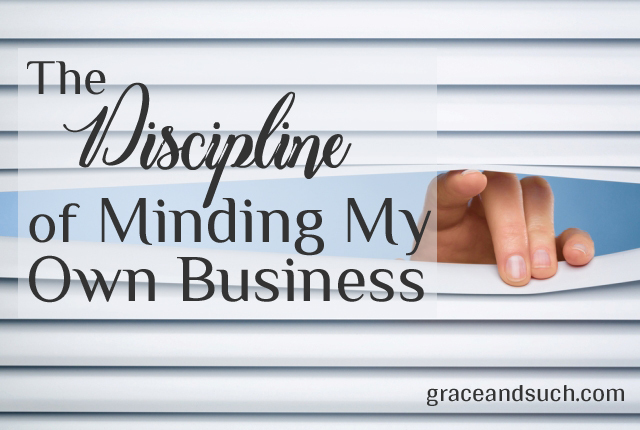 As a follower of Jesus, who is very thinky and who tends to ruminate all too much all the time, the discipline of: my part, your part, and Jesus’ part is just what I need to quiet the uglies and focus back on Him. Will it take away all of my anxiety? All of my seasonal depression and other depression? Nope. BUT, it will give me the freedom of perspective—the perspective that I’m just me, a child of God, just responsible for my part, and that’s all that’s required of me. And the music video is awesome. Great worship! I Am A Child of God. Powerful. I have chills & tears when we sing this at church. Reminds me of my place. Thanks, Gretchen for the reminder that it is God’s business not mine! Oh, my little toesies! I resemble this remark and will take the reminder of the three jobs and try so hard today to remember which is mine. Thank you. It is a discipline but I can see even from this end that it’s one worth having. Well, I stink at discipline on my own, so it’s great that the other (triune) partners in God’s part do their job so well. Perfectly, even. It’s not that I can’t mind my own business, it’s just that I know what I’m doing and want to help. Right?? So right! And what’s wrong with that???? I mean…God’s part, their part, my part. God’s part, their part, my part. In Casting Crowns’s song “What the World Needs,” one of the lyrics says “maybe the best thing we can do is just get out of the way” (heavily paraphrased), and it always makes me stop and reevaluate. God doesn’t need us–He has everything under control, and it’s so hard to just accept that when things aren’t looking the way we want them to. It’s really cool that even though God doesn’t need us, He still wants us! But He wants us to let Him do the big things. We can’t handle the big things. You hit the nail on the head, Natalie. He wants us in relationship, where we each have our part. Thank you for stopping by. I love Casting Crowns!! !